Vaslav Fomich Nijinsky (Вацлав Фомич Нижинский; transliterated: Vatslav Fomich Nizhinsky; Polish: Wacław Niżyński) (March 12, 1890 – April 8, 1950) was a Russian ballet dancer and choreographer of Polish origin. Nijinsky was one of the most gifted male dancers in history, and he became celebrated for his virtuosity and for the depth and intensity of his characterizations. He became famous for his work in the Ballet Russes, the world famous troupe created by Sergei Diaghilev that revolutionized ballet in all of Europe, although their relationship deteriorated when Nijinsky married. He could perform en pointe, a rare skill among male dancers at the time (Albright, 2004) and his ability to perform seemingly gravity-defying leaps was also legendary. Unfortunately the rare brilliance of the art and artist was coupled with a not atypical disorderly personal biography that continues to characterize creative communities to this day. Nijinsky was born in Kiev, Ukraine to a Russified Polish dancer's family. In 1900 he joined the Imperial Ballet School, where he studied under Enrico Cecchetti, Nicholas Legat, and Pavel Gerdt. At 18 years old he had leading roles in the Mariinsky Theater. A turning point for Nijinsky was his meeting with Sergei Diaghilev, a member of the St Petersburg elite and wealthy patron of the arts, promoting Russian visual and musical art abroad, particularly in Paris. Nijinsky and Diaghilev became lovers, and Diaghilev became heavily involved in directing Nijinsky's career. In 1909 Diaghilev took a company to Paris, with Nijinsky and Anna Pavlova as the leads. The show was a great success and increased the reputation of both the leads and Diaghilev throughout the artistic circles of Europe. Diaghilev created Les Ballets Russes in its wake, and with choreographer Michel Fokine, made it one of the most well-known companies of the time. Nijinsky's talent showed in Fokine's pieces such as “Le Pavillon d'Armide” (music by Nikolai Tcherepnin), “Cleopatra” (music by Anton Arensky and other Russian composers) and a divertissement “The Feast.” His execution of a pas de deux from the “Sleeping Beauty” (Tchaikovsky) was a tremendous success; in 1910 he shone in “Giselle,” and Fokine’s ballets “Carnaval" and “Scheherazade” (based on the orchestral suite by Rimsky-Korsakov). His partnership with Tamara Karsavina, also of the Mariinsky Theatre, was legendary. Then Nijinsky went back to the Mariinsky Theatre, but was dismissed for appearing on-stage wearing tights without the trunks obligatory for male dancers in the company. A member of the royal family complained that his appearance was obscene, and he was dismissed. 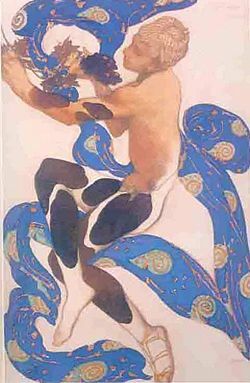 It is probable that the scandal was arranged by Diaghilev in order that Nijinsky could be free to appear with his company, in the west, where many of his projects now centered around him. He danced leading roles in Fokine's new productions "Spectre de la Rose” (Carl Maria von Weber), a role never satisfactory danced since his retirement, and Igor Stravinsky's Petrouchka, in which his impersonation of a dancing but lifeless puppet was much admired. He then choreographed three ballets himself, L'après-midi d'un faune (The Afternoon of a Faun, with music by Claude Debussy) (1912), Jeux (1913), Till Eulenspiegel (1916) and Le Sacre du Printemps (The Rite of Spring, with music by Igor Stravinsky (1913). Nijinsky created choreography far from that of traditional ballet. His radical angular movements, together with Stravinsky's radically modern score, caused a riot at the Théâtre de Champs-Elysées when Le Sacre du Printemps was premiered in Paris. As the title character in L'après-midi d'un faune the final tableau, during which he mimed masturbation with the scarf of a nymph, caused a scandal; he was accused by half Paris of obscenity, but defended by such artists as Auguste Rodin, Odilon Redon and Marcel Proust. Revivals of some of his work, based on accurate choreographic records, have shown him to be a very considerable, successful and inventive choreographer. In 1913 the Ballets Russes toured South America, and because of his fear of ocean voyages Diaghilev did not accompany them. Without his mentor's supervision Nijinsky entered a relationship with Romola de Pulszky, a Hungarian countess. It is generally acknowledged that Romola went out of her way to trap Nijinsky into marriage. An ardent fan of Nijinsky, she took up ballet and used her family connections to get close to him. Despite her efforts to attract him, Nijinsky appeared unconscious of her presence. Finally Romola booked passage on board a ship that Nijinsky was due to travel on, and during the voyage Romola succeeded in engaging his affections. Numerous speculations as to the true reason for their marriage have arisen, including the suggestion that Nijinsky saw Romola's title and supposed wealth as a means to escape Diaghilev's repression. This is unlikely—he was far too unsophisticated and innocent to have engineered a match for such a reason. Romola has often been vilified as the woman who forced Nijinsky to abandon his artistry for cabaret fare, her pragmatic and plebeian ways often jarring with his sensitive nature. This contributed largely to his decline into madness. In his diary, Nijinsky famously said of Romola "My wife is an untwinkling star ..." They were married in Buenos Aires and when the company returned to Europe, Diaghilev, in a jealous rage, fired them both. Nijinsky tried to create his own troupe, but its crucial London engagement failed due to administrative problems. During World War I Nijinsky, a Russian citizen, was interned in Hungary. Diaghilev succeeded in getting him out for a North American tour in 1916, during which he choreographed and danced the leading role in Till Eulenspiegel. Signs of his dementia praecox were becoming apparent to members of the company. He became afraid of other dancers and that a trap door would be left open. Nijinsky had a nervous breakdown in 1919 and his career effectively ended. He was diagnosed with schizophrenia and taken to Switzerland by his wife where he was treated by psychiatrist Eugene Bleuler. He spent the rest of his life in and out of psychiatric hospitals and asylums. His wife devoted her life entirely to his care, and whatever criticisms may be made of her, her devotion to him was complete. 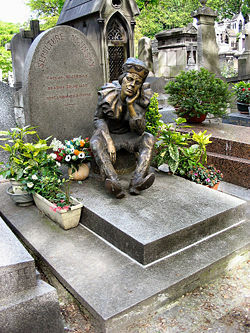 Nijinsky died in a London clinic on April 8, 1950 and was buried in London until 1953 when his body was moved to Cimetière de Montmartre, Paris, France beside the graves of Gaetano Vestris, Theophile Gautier, and Emma Livry. Nijinsky's Diary was written during the six weeks he spent in Switzerland before being committed to the asylum. Obscure and confused, it is obviously the work of a schizophrenic, but in many ways reflects a loving nature, combining elements of autobiography with appeals for compassion toward the less fortunate, and for vegetarianism and animal rights. Nijinsky writes of the importance of feeling as opposed to reliance on reason and logic alone, and he denounces the practice of art criticism as being nothing more than a way for those who practice it to indulge their own egoes rather than focusing on what the artist was trying to say. The diary also contains a bitter exposé of Nijinsky's relationship with Diaghilev. As a dancer Nijinsky was clearly extraordinary in his time, though at the end of her life his great partner Tamara Karsavina suggested that any young dancer out of the Royal Ballet School could now perform the technical feats with which he astonished his contemporaries. His main talent was probably not so much technical (Itzikowsky could leap as high and as far) as in mime and characterisation; his major failing was that, being himself unable to form a satisfactory partnership with a woman, he was unsuccessful where such a relationship was important on-stage (in, say, Giselle). In epicine roles such as the god in Le Dieu Bleu, the rose in Spectre or the favorite slave in Scheherezade he was unsurpassed. Written by Glenn J. Blumstein. Productions: The Kennedy Center (Washington, D.C. 1987); Teatr na Małej Bronnej (Moscow - 1997-1999); Występy w Teatrze Bagatela (Krakow, Poland, 1999)). Nijinsky: God's Mad Clown (Amazon.com). Retrieved August 7, 2007. Directed by Tony Richardson, the screenplay was written by Edward Albee. The film was to star Rudolph Nureyev as Vaslav, Claude Jade as Romola and Paul Scofield as Diaghilev, however producers Albert R. Broccoli and Harry Saltzman canceled the project and it was left unfinished. Directed by Herbert Ross, starring George de la Pena as Vaslav, Leslie Browne as Romola, Alan Bates as Diaghilev and Jeremy Irons as Fokhine. Romola Nijinsky had a writing credit for the film. Directed and written by Paul Cox. The screenplay was based directly on Nijinksy's diaries and read over related imagery. The subject matter included his work, his sickness, and his relationships with Diaghilev as well as his wife. Albright, Daniel. Modernism and Music: An Anthology of Sources. University of Chicago Press, 2004. ISBN 0226012670. Parker, Derek. "Nijinsky: God of the Dance." 1988. Vaslav Nijinsky: Creating A New Artistic Era Vaslav New York Public Library.